Though Baltimore was in a heyday of culture and prosperity, Green Mount Cemetery’s dedication on Saturday July 13, 1839 was an extraordinary event. The Miriam and Ira D. Wallach Division of Art, Prints and Photographs: Photography Collection, The New York Public Library. Entrance to Green Mount Cemetery, Baltimore. Retrieved from http://digitalcollections.nypl.org/items/510d47e0-6738-a3d9-e040-e00a18064a99 on September 26, 2017. Crowds arrived on foot, as well as by carriage and rail, to the new public cemetery at the edge of north Baltimore that was once the country estate of the late and prosperous merchant Robert Oliver. Towering trees and well-placed shrubbery shaded them as they strolled along the avenues to a temporary stage. There they came upon a gathering of VIPs that included Mayor Sheppard C. Leakin, Baltimore City Council members, the Baltimore Musical Association, poets and various local clergymen. The orator of the day, John Pendleton Kennedy, was a US Congressman, author, War of 1812 veteran and, later in his career, a leading abolitionist. Those who turned out for the occasion sensed the importance of this new commercial enterprise. Green Mount was among the earliest of the country’s “rural cemeteries” that replaced churchyards as a typical burial place for loved ones. Churchyards were aging, reaching capacity and vulnerable to surrounding urban development. Many believed these cemeteries were a public health menace. In a time when death began to be romanticized, rural cemeteries provided families with serene green spaces that allowed them to express grief in individualized ways. Green Mount soon evolved into a park-like oasis of custom designed gravestones, noteworthy buildings and remarkable sculptures, created by renowned artists and architects. The first burial that took place here was 2-year-old Olivia Cushing Whitridge, the fifth child of Dr. John Whitridge and his wife Catherine, who lived on N. Gay Street. Olivia’s gravestone is now in the midst of more than 65,000 others, many whose lives and accomplishments have been lost to time. However, Green Mount Cemetery remains a standout destination for us to discover the entrepreneurs, philanthropists, inventors, artists, authors, politicians and military leaders who shaped Baltimore. Many are names that still ring familiar today to Baltimoreans: Theodore R. McKeldin (former mayor of Baltimore); Johns Hopkins (philanthropist and abolitionist); A. Aubrey Bodine (photographer); Isaac Emerson (of Bromo-Selzer fame); Harriet Lane Johnston (who supported the Johns Hopkins pediatric clinic that still exists today); and Betsy Patterson Bonaparte, who led a colorful life as the jilted wife of Jerome Bonaparte and sister-in-law of Napoleon. Moses Sheppard, a Quaker and merchant, bequethed his considerable fortune to build a place where people with mental illness could receive humane care. The Sheppard Pratt Health System continues to operate today in Baltimore. The index finger pointing skyward on his tombstone symbolizes the hope of arriving in heaven after death. Green Mount Cemetery is a place in Baltimore that probably remains the least changed by time. Perhaps the original founders sensed that urban life would someday encroach the property: a permanent trust, enacted by the Maryland General Assembly assured that the cemetery would continue into the future as a sacred trust. It remains a nonprofit enterprise. 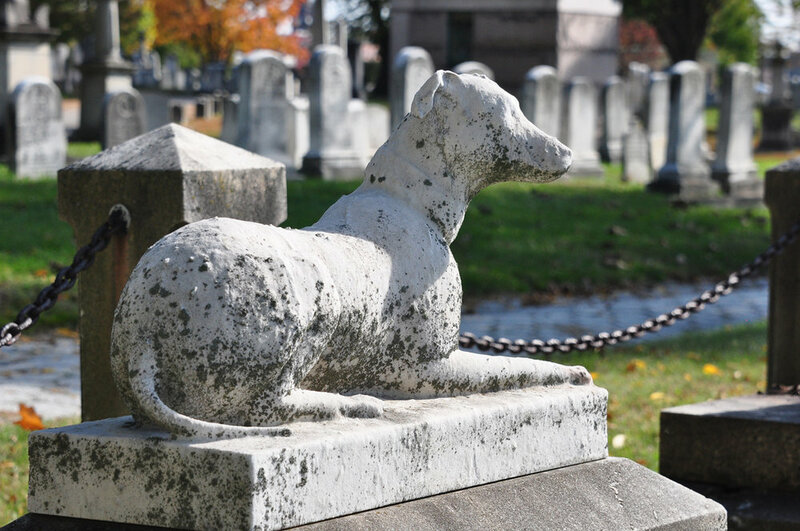 Green Mount Cemetery is a serene outdoor gallery set amidst a diverse collection of one-of-a-kind sculptures, gravestones with an assortment of funereal symbols, winding avenues and trees that provide breezy summer shade and outstanding fall colors. A secure, permanent wall surrounds the entire cemetery. There is just one entrance through the gate on 1501 Green Mount Avenue. Cemetery employees are available in the office during business hours and there are typically caretakers on the grounds. Many members of the Booth family are buried in Green Mount Cemetery, though the exact location of the remains of John Wilkes Booth are a well-kept secret. Nonetheless, many visitors leave Lincoln pennies on a blank headstone located within the plot as a small way to pay tribute to the assassinated 16th President. Maryland Penitentiary inmates took up a collection to make sure that Goldsborough Griffith, a long-time advocate for prisoner rights, had a suitable grave marker. Elijah Jefferson Bond is best known for patenting the Ouija Board in the United States and Canada. The Ouija Board was a 19th century novelty game that was reputed to help players communicate with the dead.